Although the commercial stone crab catches improved a tad last week, action remains slow for stone crab businesses due in part to unfavorable weather. 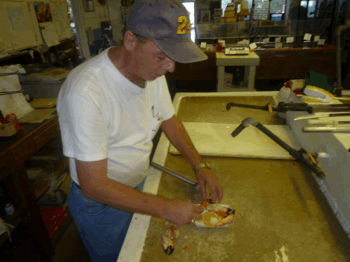 John Moore, manager of Star Fish Co. in Cortez, prepares a small dish of stone crab claws. Simply put, the demand for stone crabs is high, and the supply is relatively low, leading to higher-than-average prices at some restaurants. Karen Bell of A.P. Bell Fish Co. in Cortez said action is still slow. She added that as delivery trucks arrived from the north, some crab suppliers were trying to buy up inventory meant for A.P. Bell Fish Co.
“Can’t allow that,” Bell said. At Moore’s Stone Crab Restaurant on Longboat Key, co-owner Alan Moore said his crabbers took in about 50 percent more catch than in the opening week. Moore’s is celebrating its 43rd anniversary this month and is rolling back its prices to those of the 1990s, Moore said. Moore’s Stone Crab Restaurant opened Nov. 21, 1967. “We negotiated a good price with the crabbers,” Moore said.